My sister flew up to visit for a few days and escaped hurricane Matthew, so we had a sister weekend for the 3 of us girls roaming around Minnesota. We hopped on a trolley in Stillwater, hiked Taylors Falls and did a road trip up to Grand Marais to try to find some wandering moose, see the fall colors and listen to the waves crashing against the rocks on Lake Superior. 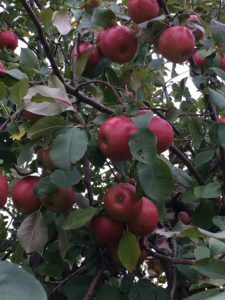 On the way home, we stopped at one of the apple orchards to pick apples for our dessert. We bought a few different kinds of apples. (That’s the secret to the best flavor and texture of an apple crisp or apple pie). Shhhhh! Pair a tart apple with a sweet apple and a firm textured apple with one that’s juicy or mushy when baked. I used Honeycrisp, SweeTango and Haralson. If I had some McIntosh, they would have gone in there as well. I love the smell of apple crisp baking in the oven and watching the leaves swirl around outside. It’s what fall should smell like. This recipe has a ridiculous amount of topping that’s not too much, because that’s really not possible! The best way to mix the topping is to get in there with your hands. Mix it up well and drop the clumps of deliciousness on top of the apples. 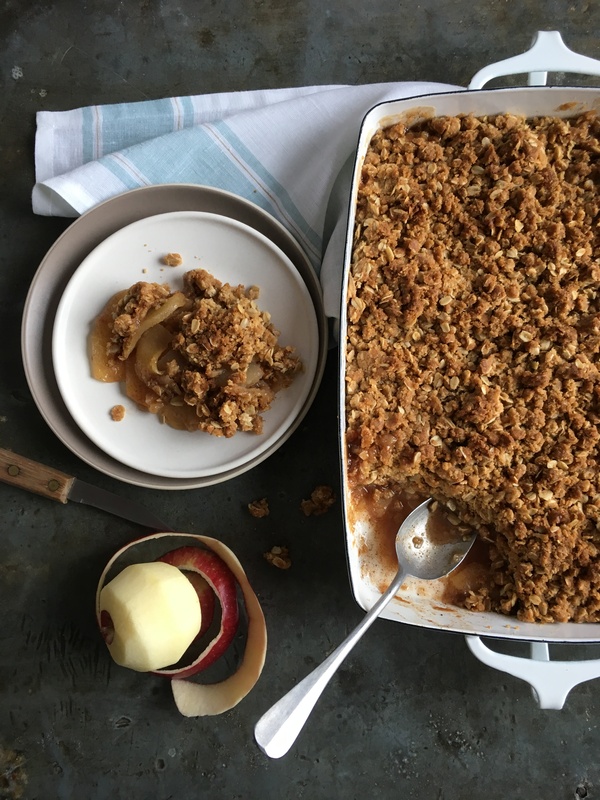 Apple Crisp is the perfect easy-to-prepare dessert this time of year. 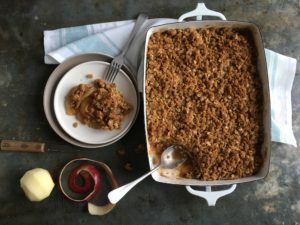 This recipe is made with a variety of apples, cinnamon, vanilla and sugar under a bed of buttery oats and brown sugar. In a large mixing bowl, toss together the apples, the white sugar, 1 tablespoon flour, cinnamon, nutmeg and vanilla beans. Pour the apple mixture into a 13x9 baking dish. For the topping: Combine the oats, flour, brown sugar, baking powder and baking soda. Add the butter and mix until it comes together in large clumps. Sprinkle the topping evenly over the apple mixture. Bake the apple crisp until the fruit is bubbling and the topping is golden brown and crisp, about 45 minutes. 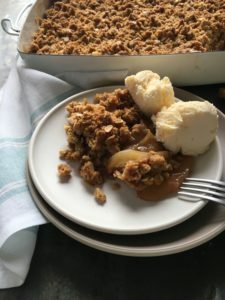 You can also make apple crisp in individual ramekins or in a cast iron skillet. Yum! I can hardly wait to try this! Thoughts of heavy topping PLUS lots of whipped cream makes my mouth water now! Thanks for the tip about mixing apple types! Let me know how it turns out Rachel! I’m going to try this. Love Apple crisp. Thanks Kathy. I hope you enjoy this recipe! Delicious! 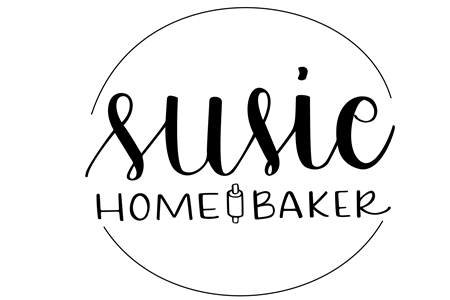 Thanks Susie for a perfect recipe and really pretty photos! I do the same…i usually throw granny smith in with a golden delicious or a honeycrisp. Love the contrast. Going to try this recipe! Granny Smith are pretty easy to find where Haralson might be more local, but I love them! Seriously, you can’t go wrong with any apple in the crisp.